Throughout the fall and winter months camp alumni regularly reach out via text or email with a similar story: I was somewhere and randomly heard this song that was used for a Color War alma mater and it immediately took me back to a favorite time of my life. And I always know what they mean, having been at K&E for over 30 summers and associating dozens and dozens of tunes with some of my best camp memories. What’s a Color War alma mater? Color War is our annual 4-day sports tournament, and during the final event each team sings a series of songs with lyrics written by the counselors. The Cheer is all about how strong and cohesive their team is while the Fight Song talks about how skilled and tenacious Kenwood or Evergreen teams play when up against other camps in tournaments. The Novelty or Comic Song (for Kenwood and Evergreen, respectively) is a lampoon of the funniest moments of the summer. The last song is the Alma Mater, in which each team has the opportunity to articulate why they love being a part of our community, why the friendships made within it are so life changing, and how much we all miss Camp during the other ten months of the year. Very often the majority of each team has tears in their eyes while they sing their song (as do the Camp counselors and Directors sitting in the audience). Recently, Deena and I were at a benefit for the Dana-Farber Cancer Institute in Boston. 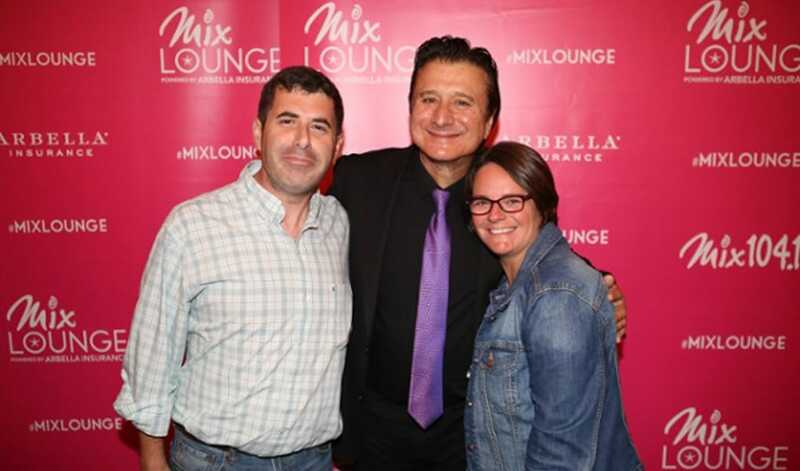 While we were there to support a cause near and dear to our hearts, we were also there for the opportunity to meet one of our musical heroes: Steve Perry, the former lead singer of the band Journey. When I was 8 years old Steve was the front man for one of the biggest acts in rock and roll, and that summer Journey’s album “Escape” was at the top of the charts. Its single “Open Arms” would be their best selling hit ever, and was the template for the Maroon team’s winning Alma Mater. Hearing this song immediately transforms me back to one of a treasure trove of memories from one of my all time favorite summers. I was happily figuring out how to live away from my parents for the first time, trying all sorts of cool new activities, and my counselor, Scott, was pretty much the nicest human being I had ever met. Yeah, I’m talking about this Scott. So knowing in advance that I was going to meet Steve Perry, the man who wrote this song that transports me to another place and time, I wrote him a thank you card. In just a few sentences I explained what our camp is about, what a Color War Alma Mater is, and why I will forever be grateful that he composed something so evocative and meaningful for me. And to his credit, he was a total class act and put it in his jacket pocket and told me he’d read it later that night. And I’d like to believe that he did. So I’m curious, current and former Kenwood & Evergreen campers and staff: what’s the song you most passionately connect with camp? Like me, was it an Alma Mater, or does it have meaning for you for an entirely different reason? I’d love to know, and would love to know the story behind it. Please share in the comment section below, or on our Facebook page, and if you went to a different camp please feel free to comment as well. Camp stories are great stories. Exciting Visual & Performing Arts Program!